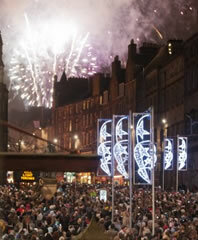 There is nothing quite like the exuberant Hogmanay celebrations each New Year in Scotland. Tens of thousands take to streets in the major cities of Edinburgh and Glasgow to bring in the New Year with a very Scottish flavour. A fun evening of celebrations and wonderful food reaches the New Years Eve climax with the accompaniment of a lone piper, the bells at midnight and the traditional singing of Auld Lang Syne (based on the words of famous Scot Robbie Burns). Each area of Scotland has their own traditions and customs for Hogmanay, although perhaps the best known and most widely continued is that of First Footing. This is where you hope that the first person crossing your threshold after midnight is a tall dark stranger bearing gifts which will bring you good luck in the year ahead. You will find Hogmanay celebrations taking place in towns all across Scotland but some of the popular bigger events can be found in Edinburgh, Glasgow, Aberdeen, Inverness and Stirling.